Though student work, this is part of a long standing dream project – a live action film of William Shakespeare’s classic play with modern visual effects. Nick Bottom is an iconic character whose depiction has never fully been realized, at least not visually, and he’s a perfect subject for a CG character study. On stage, the necessary presence of an actor’s head limits what can be done with a mask and he is often abstracted down to a set of long ears. There have been some gorgeous illustrations over the years, from Arthur Rackham to Charles Vess and these were my starting inspirations. I quickly discovered that most illustrations rely at least in part on optical illusion, cheating the perspective to achieve a successful look. I began by sculpting several dozen clay maquettes and eventually several full sized sculptures before building and rigging the digital model. These quickly revealed the considerable difficulty of hybridizing a donkey head on human shoulders lies primarily in resolving the tension between opposing goals, achieving balance without compromise. The Neck. On a donkey, the head sits atop a horizontally oriented neck that broadens considerably toward the withers. Capturing some of this aspect in a form that looks appealing on top of human shoulders is quite tricky. 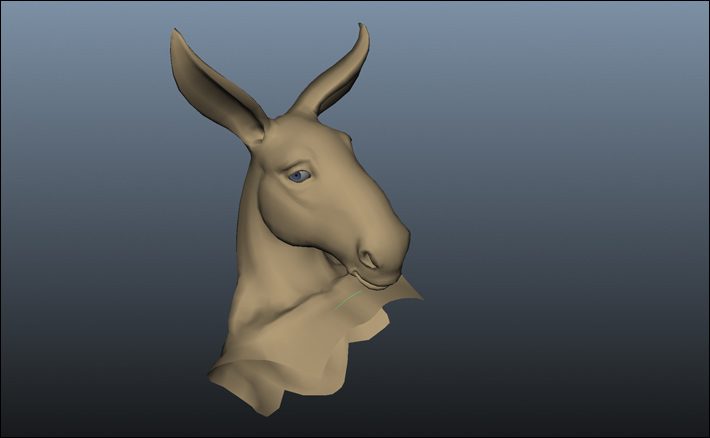 In addition to shortening the neck, I reduced the jaw considerably. The neck leans forward and curves in the dorsal plane in a manner that is neither equine nor human. Laterally, the broadening of the neck is distributed into enlarged trapezius muscles. The Eyes. We’re accustomed to reading forward facing eyes and seeing both at once, but equines are prey animals so their eyes are situated on either side of the head. A fully anthropomorphized pair of eyes comes across as cartoonish. 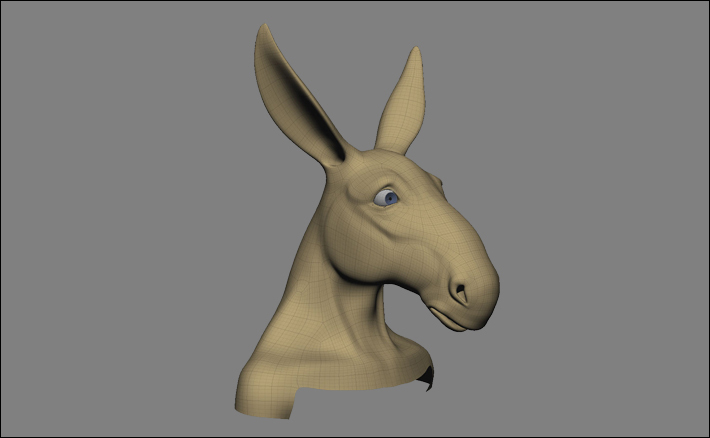 While this is fine for Donkey in Shrek, it completely undermines a photorealistic CG Nick Bottom. There was no shortcut to the right solution; I simply sculpted dozens of iterations before it felt right. The eyes are also much larger than human eyes to remain consistent with the new proportions. The Muzzle. 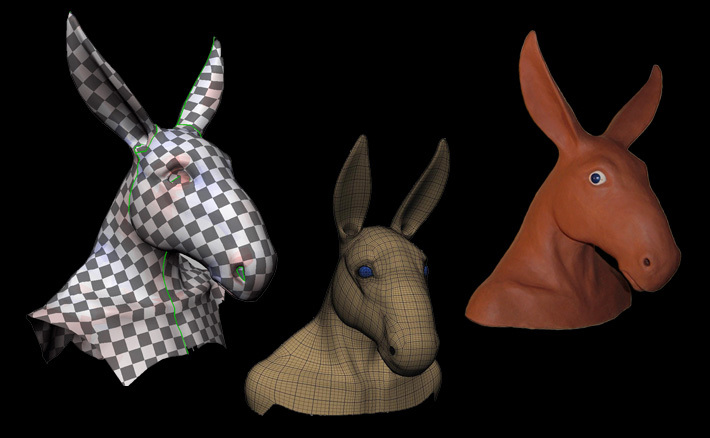 Not only is the donkey head relatively massive, the muzzle is quite long, making it difficult to include both the mouth and eyes in the same frame. A literal interpretation results in a very small strike zone for effective expressions and camera angles. In many sculpts, a shorter muzzle length sacrificed the donkey quality and often evoked other animals – dogs, moose, camels, and the like. 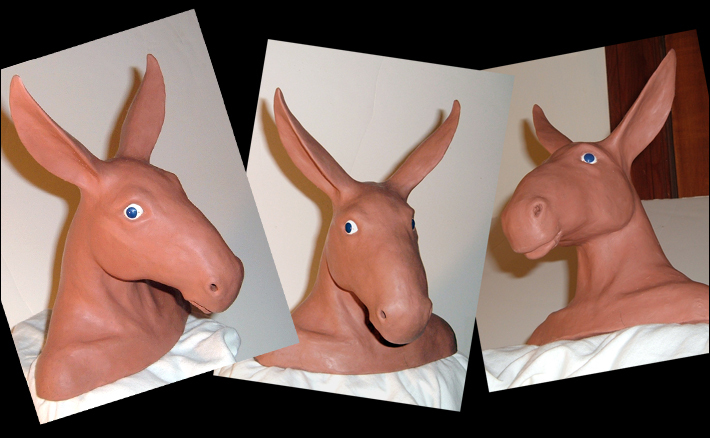 Ultimately, I decided the literal shape was secondary to embodying the donkey feel, which I achieved by focusing on verisimilitude in the nostrils and mouth while styling the bridge along the lines of classic illustrations. The Ears. Donkey ears are exceptionally expressive, much like those of cats but their size makes them even easier to read. It’s extremely important that the model’s topology and rigging support a full range of movement. Nick Bottom for a live action Midsummer Night’s Dream remains a cherished personal project and work in progress that I hope to carry through as part of a complete film one day.